Forestlawn 2nd Graders will be going to the Natural History Museum on May 7th. Please return your child's permission slip with $7.00 to the school office by April 26. Please remember to pack a bag lunch for your child, no glass bottles. The Scholastic Book Fair will be at our school April 23-29th during Library connect time. This is a Buy One Get One event. Thank you in advance for helping out at the Book Fair and making this fun event possible for the students! Miller Nature Perserve, located at 2739 Center Rd., Avon, will once again host a dinosaur display. Travel through time and experience the very first dinosaurs to present day relatives. Test your knowledge of the ages, discover facts, new dinosaurs and see how you "measure up" against the big ones. The display is open daily from 10AM - 5 PM, thru May 27th, cost is $2.00 per person. Special Olympics will be held at Ely Stadium on Friday, May 17th starting at 9:00am. We have a rain date on Tuesday, May 21st. We are switching the classes around at lunch/recess. This will allow the students to get to play with their friends that are in other classes. NOTE: If you missed the April 10th registration date, please email Mrs. Glass at tglass@sheffieldschools.org with the following information: Child’s name, date of birth, address and a phone number you can be reached at. Once this information is received you’ll receive a registration packet with instructions. Registration for preschool and kindergarten students will be held at Knollwood School. We will be holding a registration on April 10th from 9-11am, 1-3pm and 5-7pm. Please remember, your child must be age 5 on or before August 1st to enroll in Kindergarten. If you are Open Enrolling your child, you must apply for Open Enrollment at the Board Office and be approved before you can register your child. Once you have your approval letter for open enrollment, call the school office at 440-949-4234 to make an appointment to register your child. Knollwood offers full day Kindergarten and ½ day Kindergarten. Full day Kindergarten gives our children twice the exposure to reading, language arts, and math skills which will help them for their lifetime. We hope that you will take advantage of this added opportunity. Cost will be $2,000.00 and is payable monthly with a $200 deposit due at registration. Fee waivers are available for families who qualify. Half day kindergarten is tuition free, however there will be a one-time school fee for workbooks, supplies, etc. payable in the fall. The hours for the all-day Kindergarten is 8:20am-3:20pm and ½ day hours are 8:20am-11:20am. Knollwood Elementary will also be offering half day preschool. Preschool is tuition based and the cost is $1,500.00 for the year payable monthly with the first payment of $150.00 due at registration. Second payment will be due September 1st with the rest of the payments due on the 1st of every month through May. There is no school for preschool students on Wednesdays. Preschool hours are 8:20am-11:20am & 12:20pm-3:20pm. There is a procedure for parents visiting during the school day at Knollwood and Forestlawn this year. When a parent wants to visit their child's classroom during the day, the parent will have to either call or email the teacher to set up an appointment. Frequent distractions interrupt the educational process of learning for all the students and it is often hard to get all the students back on the learning track. Thank you for helping us keep the learning environment a productive one. Use our link to Shutterfly and 8% of the sales will go to Forestlawn Elementary. Click here for the link. The lost and found bins are filling up. Please remind your child to check the bins for any items they may be missing. Please mark your calendars with these dates. Is your child not feeling 100% but you're not sure if you should keep them home or not? Please see THIS LINK for more information. Everything you need to know but hope you never have to know about head lice. Click on the title to learn more. INFOhio Early Learning Portal is a quality digital resource for early learners ages three through five. 1. Come into the school office and let them know you wish to become a school volunteer. The office will notify the secretary at the Board Office that you will be coming over to get the paperwork needed. 3. Then make an appointment for your background check, both a FBI/BCI. 4 . Once the background check is received, the building Administrator will send a recommendation to Mr. Cook to have the volunteer names placed on the Board Agenda to be approved. 5. Once you are Board approved, you will be able to begin to volunteer. Thank you for being a very important part of our schools. The students and staff appreciate all that our volunteers do for us. Please know the Sheffield-Sheffield Lake City School District pays for all of our volunteer background checks. Click HERE to see the bus routes for the 2018-19 school year. 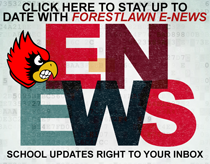 Please keep in mind as the school year begins, there will be procedures to the entry and dismissal at Forestlawn. The entry bell for all students is at 8:20. If your child is a car rider, please drop your child off at the main doors to enter into school. No child is allowed to wait outside the doors without a parent or guardian BEFORE 8:20. THERE IS NO WAITING IN THE FOYER AREA OF THE SCHOOL. Students must be in their homerooms and ready to work by 8:35 or they will be counted tardy. End of the day dismissal is at 3:20. All bus riders will be dismissed out the back gym doors. Bus riders will leave as soon as their buses arrive. Walkers and bike riders will be dismissed out the East doors of the building. Our crossing guard will be checking tag numbers for any parent that wishes to walk with their child. She will cross students needing to cross Forestlawn Ave. and walk the other students down to Lake Breeze Rd. and cross them. All car riders will be dismissed out the front doors. THERE IS NO WAITING IN THE FOYER AREA OF THE SCHOOL . All parents will show their numbered key ring to the staff member at the door and they will find the child with the matching number. Please help us make this process be as smooth as possible. If you have forgotten your numbered key ring, we ask that you wait until the end of dismissal to identify your child in the office with ID. Thank you for your continuous support. If you have any questions regarding this procedure, please call the office at 949-4238. Please remember that Forestlawn Ave. is a one way (Westbound) during morning arrival and afternoon dismissal times. PLEASE NOTE THAT NO CARS ARE TO ENTER THE PARKING LOT DURING ARRIVAL OR DISMISSAL TIMES. Please join us for a free family spaghetti dinner on Tuesday, April 30th from 5:30-7:00 P.M.
Penny Morgan, supervising clinical counselor at Firelands Counseling & Recovery Services, joins us for a short parent informational night on school readiness and school success in early childhood learners. Please see the attached flyer for more information by clicking on the header "Knollwood School Readiness Spaghetti Dinner". The program will be held at Brookside High School and there is NO cost for this event. This program is sponsored by the Sheffield-Sheffield Lake Teachers’ Association (OEA/NEA)- which is the professional association & collective bargaining unit for the certified staff of the Sheffield-Sheffield Lake City Schools.